Town & Country Essentials FULL Length Wellington Boots. FULL Length Wellington Boots. Style: Essentials. Colour: Green. Made By: Town & Country. 100% Waterproof. FULL Length Boot. Size: UK4, EU 37. Town & Country Essentials Half Length Wellington Boots. Half Length Wellington Boots. Style: Essentials. Made By: Town & Country. Half Length Boot. Size: UK3, EU 36. Strengthened seams. 100% Waterproof. Town & Country Essentials FULL Length Wellington Boots. FULL Length Wellington Boots. Style: Essentials. Colour: Green. Made By: Town & Country. 100% Waterproof. FULL Length Boot. Size: UK3, EU 36. 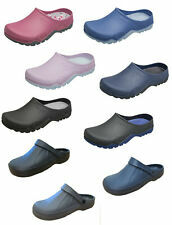 TOWN&COUNTRY GARDENING SHOES/CLOGS UNISEX Lightweight Clogs CHEAPEST ON EBAY!! 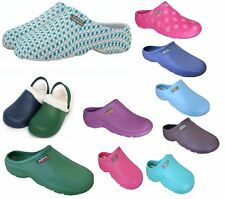 I have for sale genuine Town&Country EVA Cloggies at a bargain price £6.999for a pair! Cushioned and comfortable lightweight with a simple slip on- off design. These Town and Country Cloggies are perfect for many and varied uses both work and pleasure originality designed for use outdoors in the garden and on the beach but with adaptability for use in many other arenas indoors and out. 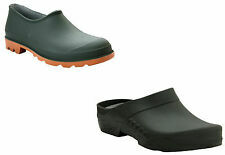 High quality Town & Country gardening shoe suitable for taking on any tasks around the garden. These classic unisex slip-on gardening clogs are from Town & Country. Material: Hard water resistant rubber to protect against any water spillages. Size: Uk9 / Eu 43. pair of steel toe cap Wellington Boots Inyati wayne. 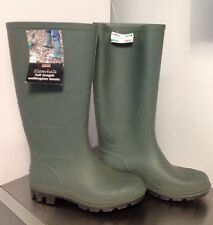 Product: Wellington Boots. Type: Steel Toe Cap. These are all characteristics you will find in the Inyati boot range. Colour: Red. Make any Sloggers Boot or Shoes one-half Size Smaller. Half-Sizer Insoles. For the Perfect Fit. HAVAIANAS EU39 UK5.5 Aubergine welly,(have black also) for girls and ladies.New. New in box EU39 UK5.5. HAVAIANAS Helios Adult Aubergine welly, lovely colour for girls and ladies. I also have one Black pair available if you prefer. They are made from 100% recyclable material and the soles can contain up to 50% recycled material. Paw Print design. Paint And Paint Supplies. Hand Tools And Tool Accessories. CHANGING OR CANCELING YOUR ORDER. They are made from 100% recyclable material and the soles can contain up to 50% recycled material. Half sizes order up and use the included Half Sizer insole if needed. Chicken print barn red. Paint And Paint Supplies. Gebraucht - geschrubt 43/44 - netter.